Deck Builder: Why Buy A Deck With Your Tax Refund? Tax Day is just around the corner. Whether you filed early or are waiting until the last second, we hope that you’re getting a nice refund from Uncle Sam. Have you given any thought to what that extra cash will go toward? Sure, you could put it in your savings account or retirement fund like every year. Another responsible idea would be to knock down some high-interest debt with your refund. On the other hand, what if you did something out of the ordinary this year? No, we’re not saying you should gamble away your refund or buy some crazy gadget you’ll ultimately never use. What about using your tax refund to buy a deck? Hear us out on this one: a deck makes the perfect addition to any home. Keep reading as we explain why you should purchase one of our premade decks. They’re dependable – You wouldn’t waste your money on something that breaks down in a few years, would you? Rest assured that our prefab decks are constructed using only premium-grade, treated lumber. Not only that, but they’re built to meet or exceed federal safety standards. With Ready Decks, your family’s safety is never compromised. It’s our belief that when you invest in a deck, the finished product should be completely dependable. They provide unmatched value – Few other premade decks are reliable. That’s not the case with Ready Decks products. Simply take into account the combination of high-quality materials we use and a patent-pending building system. Not to mention, our decks look better and last longer than many outdoor products on the market. You can expect to enjoy your deck for years to come. They expand your living space – Nothing beats relaxing on a deck with friends and family. Once the installation is complete, don’t be surprised if you find yourself wanting to host parties, barbecues, and other gatherings on a regular basis. Feel free to get creative by adding potted plants, outdoor furniture, and storage options to achieve your desired look. They’re environmentally friendly – Our deck contractors make it a point to use the most environmentally friendly and green building materials available. Such an effort doesn’t prevent us from building decks that withstand years of harsh sunlight and storms. One more thing here: Ready Decks donates a tree for every deck built. It’s yet another reason to buy from us! They’re affordable – More than two decades ago, our founder realized the need for quality decks at an affordable price. It was also apparent that homeowners were either getting ripped off with awful products or their daily lives were getting interrupted for weeks at a time. It’s our belief that every homeowner deserves a beautiful deck without breaking the bank. 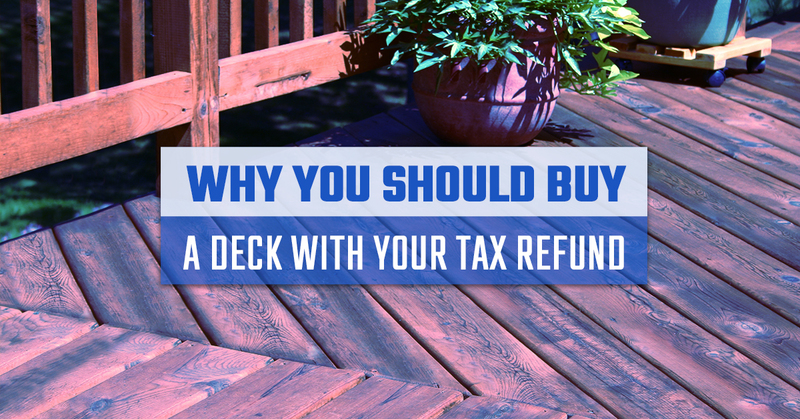 If you’re debating what to do with your tax refund, a new deck could be the answer. Our team at Ready Decks can help make your dream of having a deck a reality. We even have flexible financing options available for your convenience. Contact us today.